Nebenstehend finden Sie die aktuelle Ausscchreibung sowie den Meldebogen für Teilnehmer und Unterkunft. 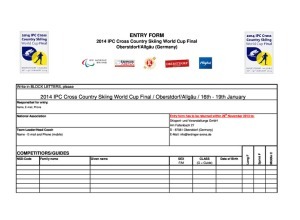 Here you can find the official invitation plus the entry-form and the accomodation-form. Der Team-Guide steht Ihnen hier in Kürze zur Verfügung. Er enthält alle wichtigen Informationen rund um die Rennen und den Wettkampf. Um den Team-Guide online durchzublättern, doppelklicken Sie einfach unten auf die Grafik. The Team-Guide will soon be available with all necessary information about the races and the competition. To flick through the team guide online, just double-click on the graphic below. 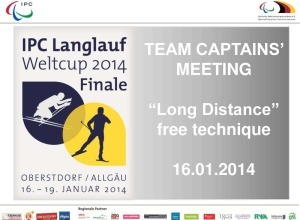 first of all we – the Organizing Committee Oberstdorf – wish you and your teams a HAPPY NEW YEAR 2014! 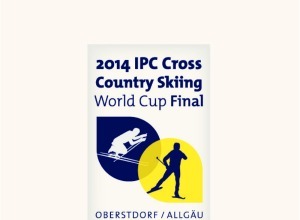 There are only a few days to go until the 2014 IPC Cross Country Skiing World Cup Final in Oberstdorf/Allgäu. 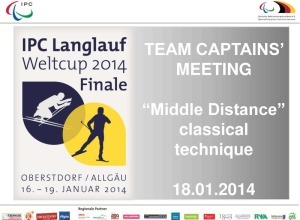 The competitions will take place – depending on snow situation we need to do some changes in the courses. Race Office / Accrediation Office directly at the Cross Country Stadium (close by the Team Hospitality Tent). Guide” with all important information, schedules and contacts for you. taking part at the competitions. Please notice: there is no transportation service in Oberstdorf – the teams are responsible for their own transport. – pick up time based on the flight information we got from you. Not all teams have booked a wax cabin with us. We would like to point out that ski waxing is not possible in the Team Hospitality Tent and also not inside your hotel rooms. Thank you for your cooperation. However, if you need a wax cabin please contact the Race Office for a last minute booking. times champion of cooking world championships – will serve delicious fingerfood for you. place directly in the Cross Country Stadium. We wish you a safe and pleasant journey to Oberstdorf - we are looking forward to welcoming you! Für kleinere Teams stehen eine begrenzte Anzahl an Sprintern für den Flughafentransport zur Verfügung. For smaller teams we have a small number of mini buses for the transport from the airport. Bitte teilen Sie uns bis 15. Dezember mit, ob wir einen Bus für Sie reservieren sollen. Plaese tell us until 15th December if we should book a bus transport for you.